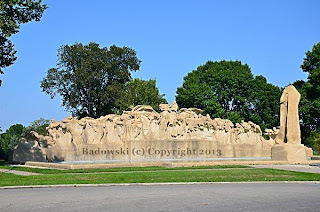 Located in Washington Park, a 367-acre expanse designed by Frederick Law Olmsted, Lorado Taft’s Fountain of Time is the only realized portion of his grand beautification scheme for the Midway Plaisance, a mile-long and 220 yard-wide area linking Washington and Jackson Parks on Chicago’s south side. Originally, he envisioned an equally monumental “Fountain of Creation” to be erected on the east end of the Midway, consisting of figures emerging from the earth, acting out the Greek legend of Deucalion and his wife Pyrrha, who repopulated the earth following the Deluge by throwing stones over their shoulders. Visitors to the east end of the Midway will find, instead, the Thomas G. Masaryk Memorial, installed in 1955. Time goes, you say? Ah, no. Alas, Time stays; we go. In addition to being a haunting and visually stunning work, the Fountain of Time was an incredible technical achievement for the time. As stone carving and bronze casting were ruled out due to expense and time considerations, Taft appealed to John Joseph Earley, a sculptor who had developed a pebble-finish architectural concrete to complete the casting. Over 4500 pieces comprised the finished mold but Earley was able to complete the casting in less than a year and the work was unveiled in 1922. Since that time, due to vandalism and the effects of harsh weather and pollution, the sculpture has undergone a number of renovations and repairs.